Create unusual styles and a variety of textures with Underglaze Chalk Crayons by Amaco. 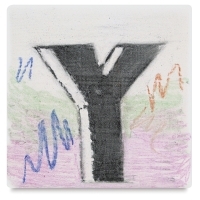 A watercolor effect can be obtained by brushing chalk sketches with water. For pastel techniques, draw on bisque ware, then finish with a transparent glaze. Sketching on bisque will result in a pebbled appearance. Underglaze Chalk Crayons can also be blended by rubbing with fingers. 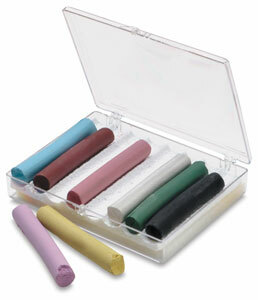 Amaco Lead-Free Underglaze Chalk Crayons work best with clear transparent glazes at Cone 5. Individual crayons measure approximately 2-3/4" × 7/16" (7 cm × 1 cm), and are slightly irregular in shape. Set No. 2 — Eight colors in a plastic hinged box, including Lilac, Yellow-Green, Gray, Medium Green, Light Brown, Blue-Green, Dark Brown, and Medium Blue. Set No. 1 — Eight colors in a plastic hinged box, including Turquoise, Yellow, Rose, Dark Blue (CL), Brown, Dark Green, Black, and White.